SAN DIEGO - Philip Rivers gingerly eased himself onto the stool at his locker, clearly sore after injuring his leg and then having the wind knocked out of him. While beat up, at least Rivers and the San Diego Chargers weren't beaten as they had been in their previous three games. Rivers threw a 22-yard touchdown pass to Malcom Floyd on the game's third play from scrimmage, and the Chargers held on for a lacklustre 13-6 victory against winless Oakland on Sunday, extending the Raiders' losing streak to 16. The Chargers (6-4) snapped a three-game skid and welcomed back Ryan Mathews, Manti Te'o and Melvin Ingram, who had been out since September. "Oakland played well today, and it probably wasn't our best offensive day, but they had a lot to do with it," Rivers said. "We found a way to win, and that is what it's all about." The losing streak by the Raiders (0-10) is the equivalent of a full season. Monday is the one-year anniversary of their last win, 28-23 at Houston. Rivers was hurt after a 28-yard completion to Floyd was negated by a holding call against left tackle King Dunlap midway through the third quarter. 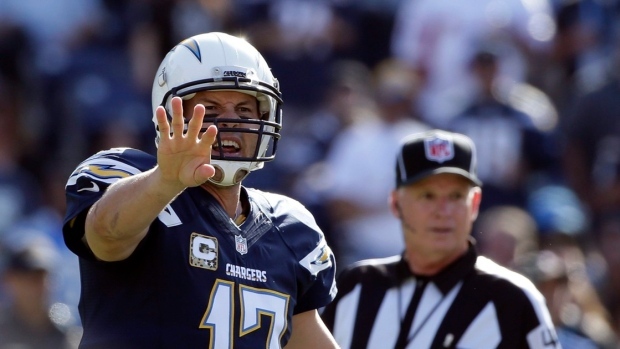 The Chargers had to settle for Nick Novak's 52-yard field goal that made it 13-3. He had the wind knocked out of him in the fourth quarter and was walking gingerly on the sideline as backup Kellen Clemens warmed up. "I will be fine," Rivers said. In a revelation sure to make coach Mike McCoy blanch, tight end Antonio Gates let it slip that Rivers has been playing with a rib injury. "He took some shots. He's been taking shots all year. For those who don't know, he's been dealing with a rib injury, a very severe rib injury," Gates said. "So he's been toughing it out these last three, four weeks." McCoy does whatever he can to keep injury information from the outside world. Rivers went back in after Sebastian Janikowski kicked a 25-yard field goal to pull the Raiders within a touchdown with four minutes to play. The Chargers were coming off their bye, which was preceded by a 37-0 loss at Miami on Nov. 2, their worst in 18 seasons. Rivers was 22 of 34 for 193 yards. "I didn't throw it as good as I need to throw it, but they covered us some — credit to them," he said. "A lot of times there wasn't a lot there." The Chargers came up with a huge play on third-and-3 after the Raiders closed within a touchdown when Gates tipped a pass to himself between safeties Charles Woodson and Brandian Ross for a 15-yard gain to the Oakland 45. "Awesome catch," Rivers said. "I think I should have thrown it to him sooner." Woodson was in position to break it up or intercept it. "That's a play I should have made," Woodson said. "I felt I let the team down. I don't know how many times I caught balls like that. ... That's how the season's going. It's been that close a lot of times." Oakland got to the San Diego 7 with 4:10 left, but the drive stalled and Janikowski kicked his 25-yarder. A desperation pass by Raiders rookie Derek Carr fell incomplete short of the end zone as time expired. Carr was 16 of 34 for 172 yards. "Obviously there is a lot of anger," Carr said. "Obviously there is a lot of disappointment. But no one's giving up; no one is going to give up." Novak extended his franchise-record streak to 32 consecutive field goals by making a 23-yarder late in the second quarter. He then pushed a 48-yard attempt wide left as the half ended. Carr fumbled on the game's first play from scrimmage when he mishandled a shotgun snap, and San Diego linebacker Donald Butler recovered at the 22. Two plays later, Floyd leaped to catch a touchdown pass over T.J. Carrie. Carr almost led the Raiders to an upset of the Chargers on Oct. 12 but was intercepted with 1:13 to play to preserve San Diego's 31-28 victory. The Raiders crossed the 50-yard line only twice Sunday. They got to the San Diego 23 on their third drive before settling for Janikowski's 42-yard field goal. NOTES: Each team punted nine times. ... Raiders first-round draft pick Khalil Mack had his first career sack. ... Mathews had 70 yards on 16 carries. He limped out of the locker room, his right knee heavily wrapped. It was his first game back since spraining the knee in a win against Seattle on Sept. 14. ... Chargers rookie Jerry Attaochu, also returning from an injury, had a sack. ... Chargers C Rich Orhnberger (ankle) and NT Ryan Carrethers (elbow) left and didn't return.